It’s the end of August, school is in, and beach time is almost gone; here in Pennsylvania. But in Hawaii the beaches are always open. 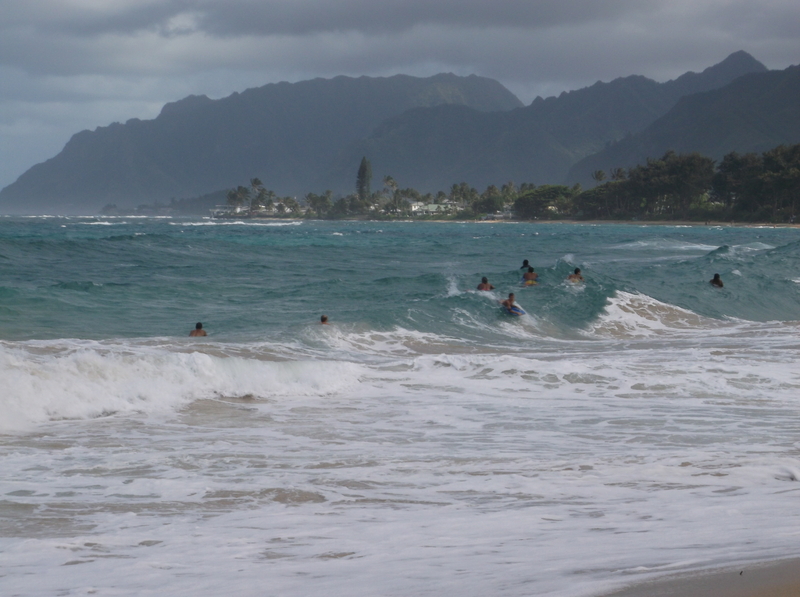 In this post I just want to share the different beaches in Oahu that we visited in April. They are all pristine in their own way, and offer wonderful views of incredibly blue ocean. You go to different beaches for different reasons. What do you want to see, or do? 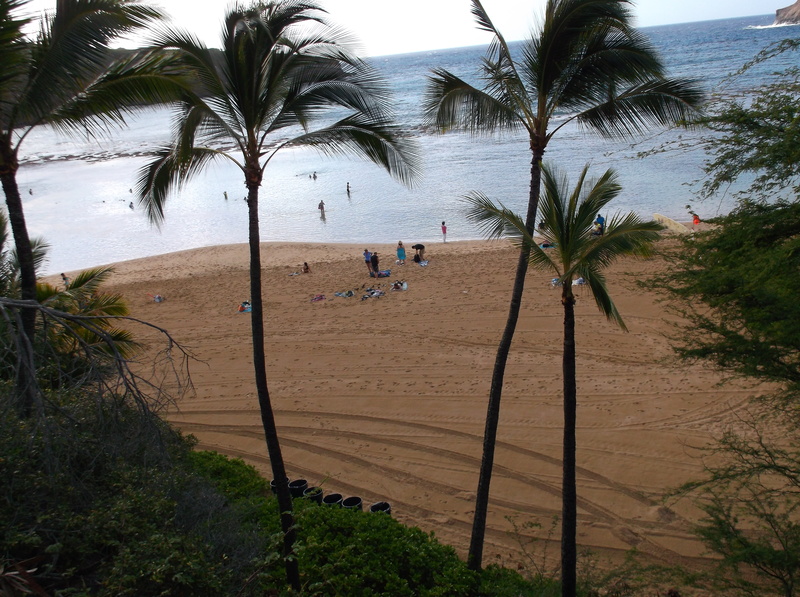 Surf, swim, snorkel, sit or just watch people? The choice is yours. First up? 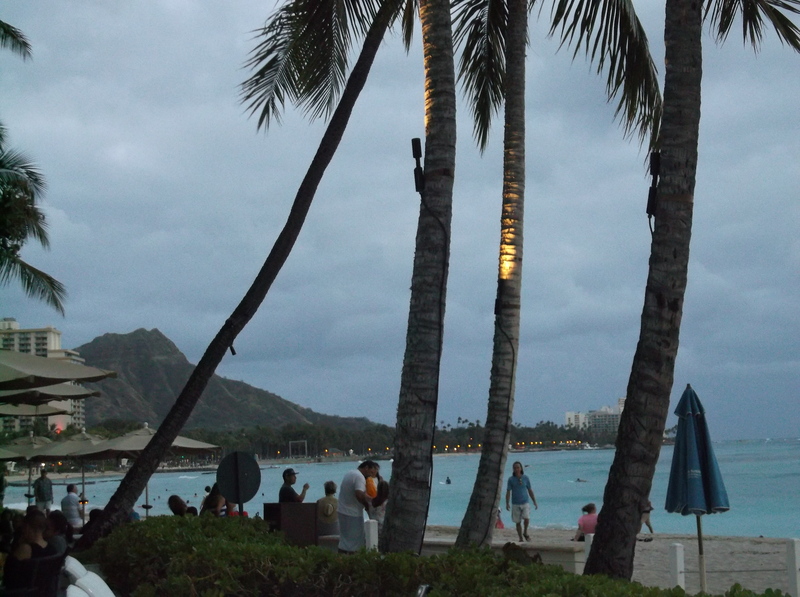 Waikiki Beach. Reason? Sometimes you don’t even need one, you just gotta do it. There are so many views and pictures you can get of this most popular beach area on the island. This view is from the top of Diamond Head. 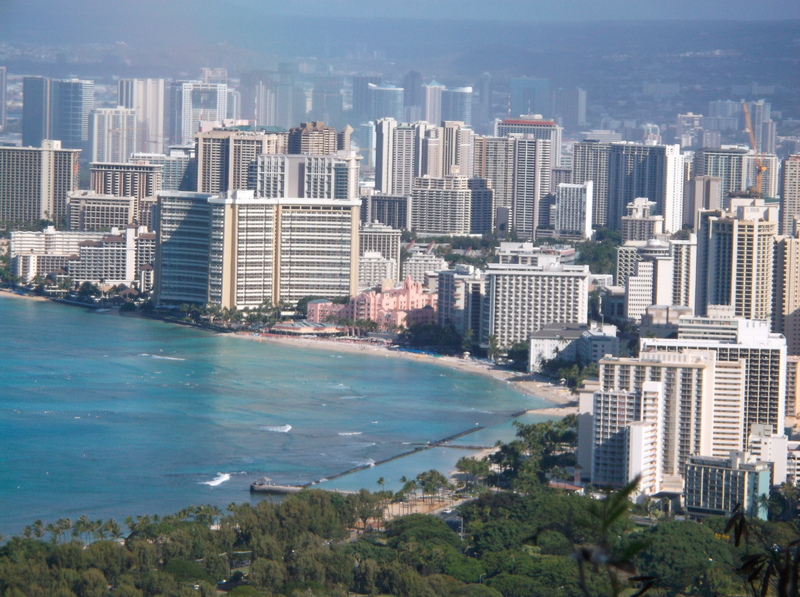 Here we are looking down from one iconic land mark to another, The pink Royal Hawaiian Hotel. 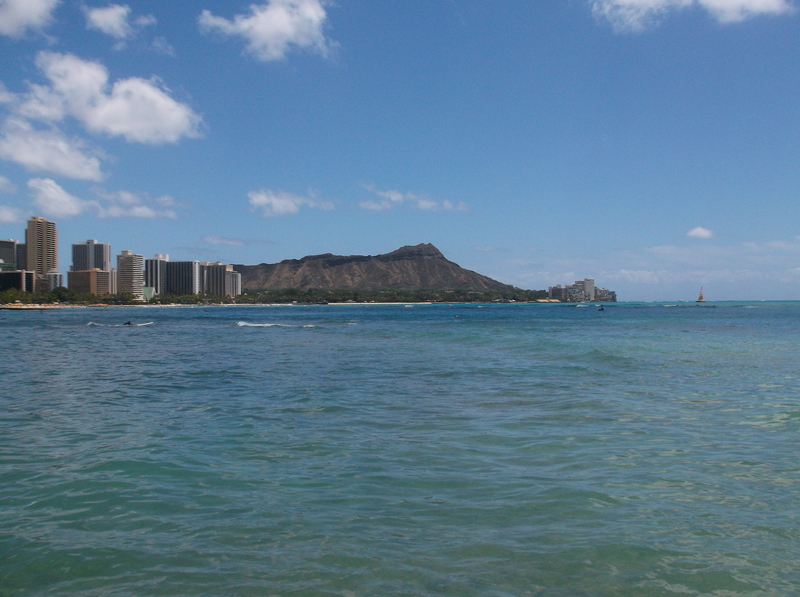 At some point you have to get this shot of Diamond Head. 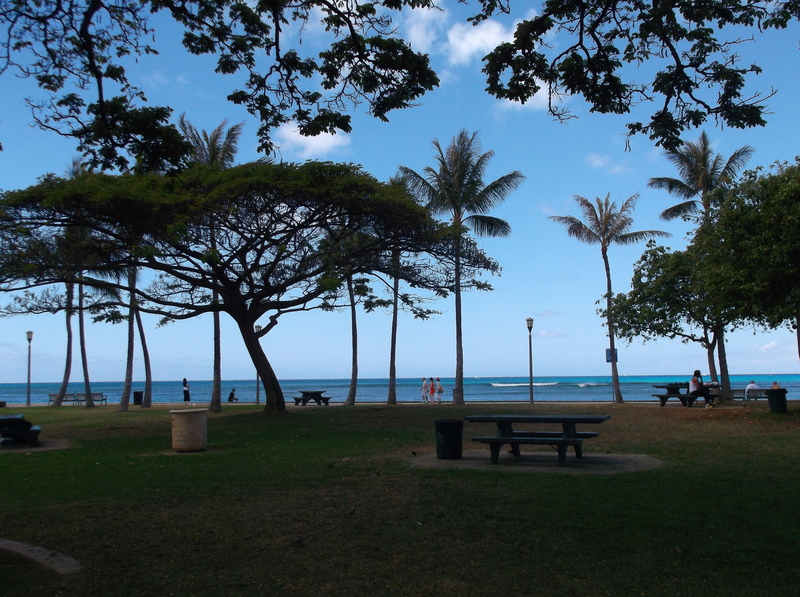 Ft DeRussy, with its grass, picnic tables and trees, is not to be missed. But now it is time to get out of town and head to beaches for other reasons. 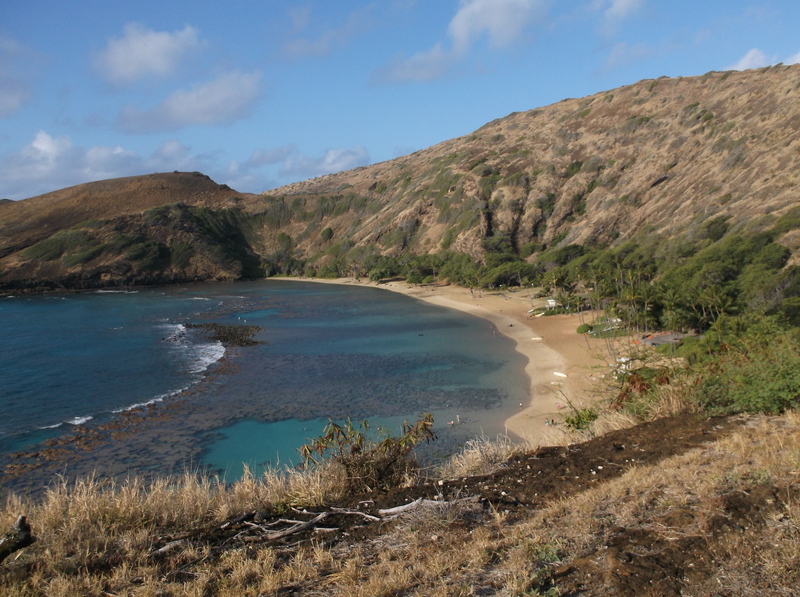 Come early to beat the crowds and take a look at beautiful Hanauma Bay. The water is so clear you can almost see the fish from above, but don’t miss the chance to get your head under water and take a look at what is going on in the world below. A long time ago my friend and I made a climb right up the side of that mountain making a path as we went. 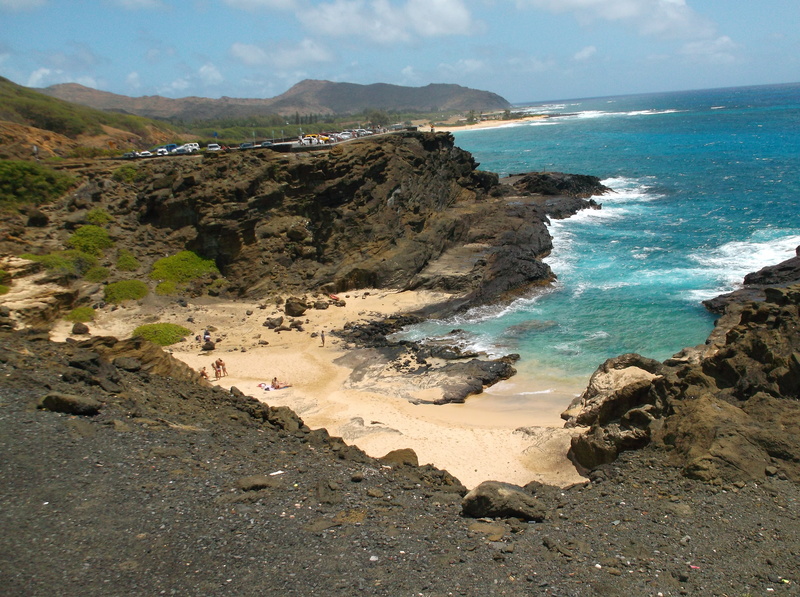 You can read about it and many other days spent at Hanauma Bay, and many other of these beaches in my book A Wish Called Wanda. Any beach along the Coco Head coast line is a feast for the eyes. I love this secluded beach, can’t remember the name of it. Can anyone help me out? 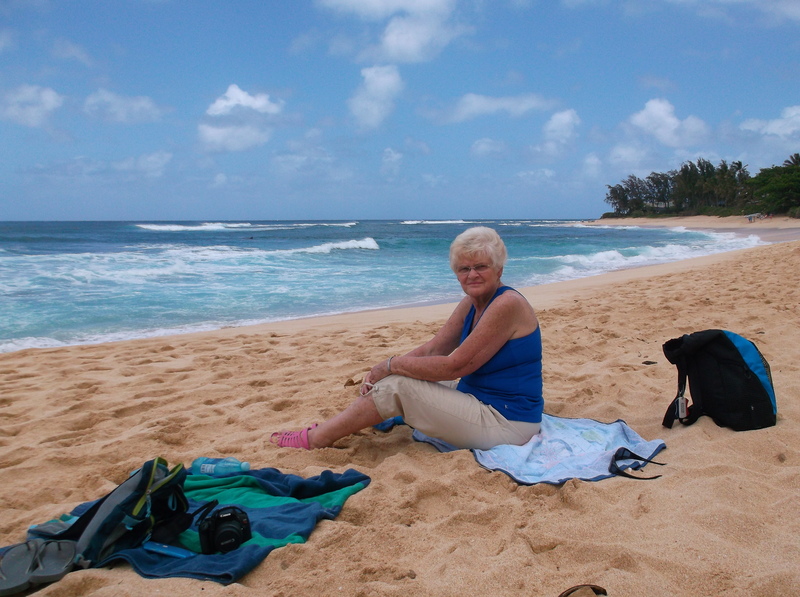 Some beaches are just for sitting, especially when the life guard is yelling “Do not get in the water unless you are an experienced body surfer.” Fifty years ago there was no life guard at Sandy Beach and I bottomed out a time or two there. 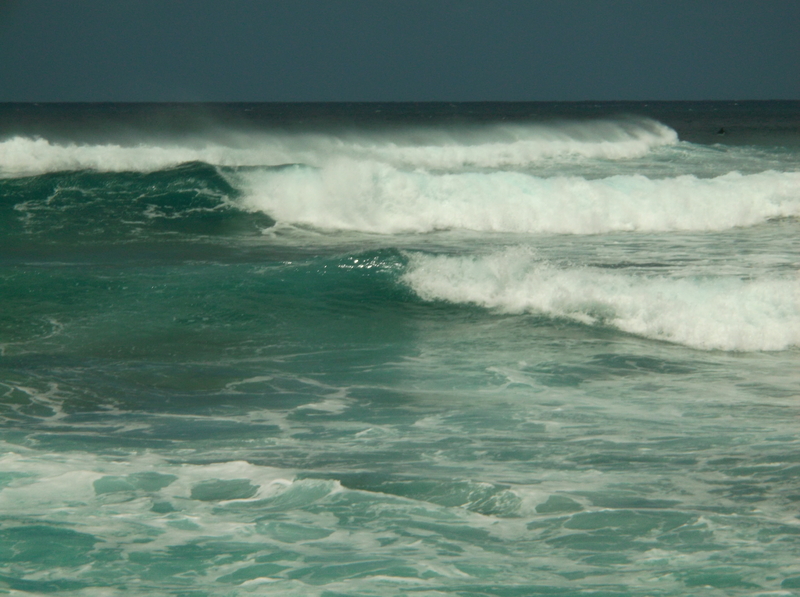 Surf is pounding on the North Shore beaches. Loved watching this surfer catch an unusual wave. 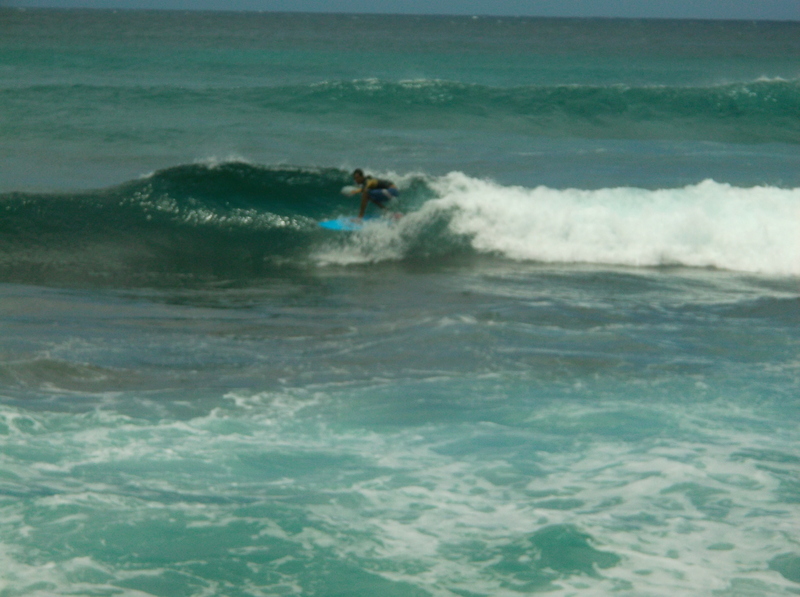 You gotta love it when the waves just keep on rolling in. 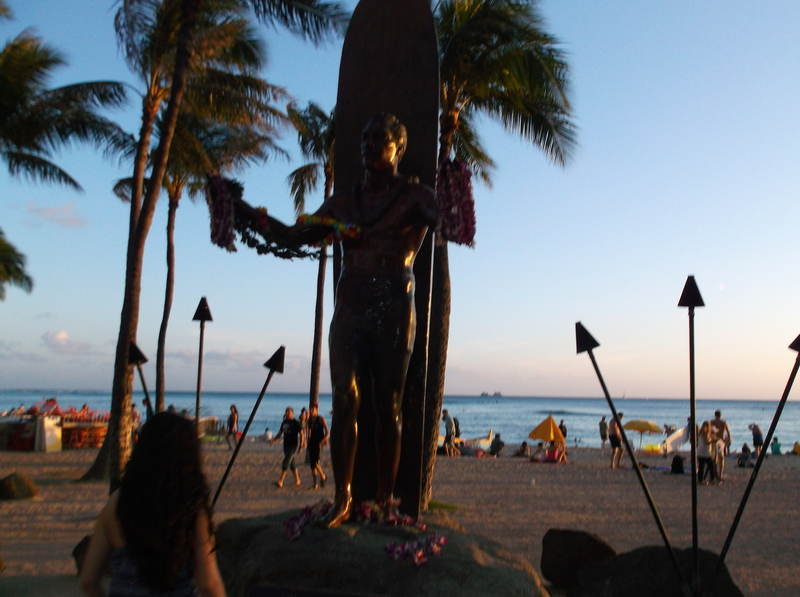 Speaking of surf, let’s go back to Waikiki to check in on Hawaii’s celebrated surfer, Duke Kahanamoku. Recently Google gave him a shout out on his 125th birthday. My favorite is watching the local surfers gather to hang out and catch the big ones. So there you have it. 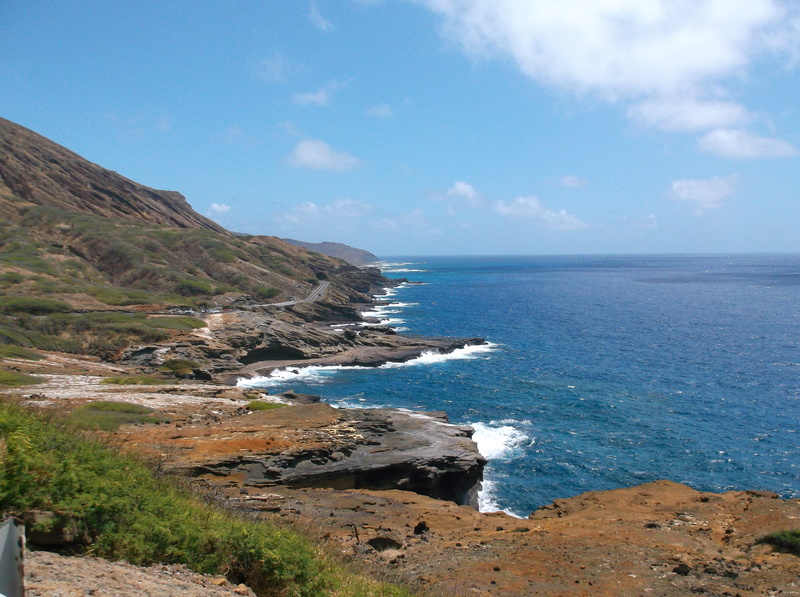 A tour of a few beaches on island of Oahu. One more reason for checking out the water. You never know what you might see looking back at you. 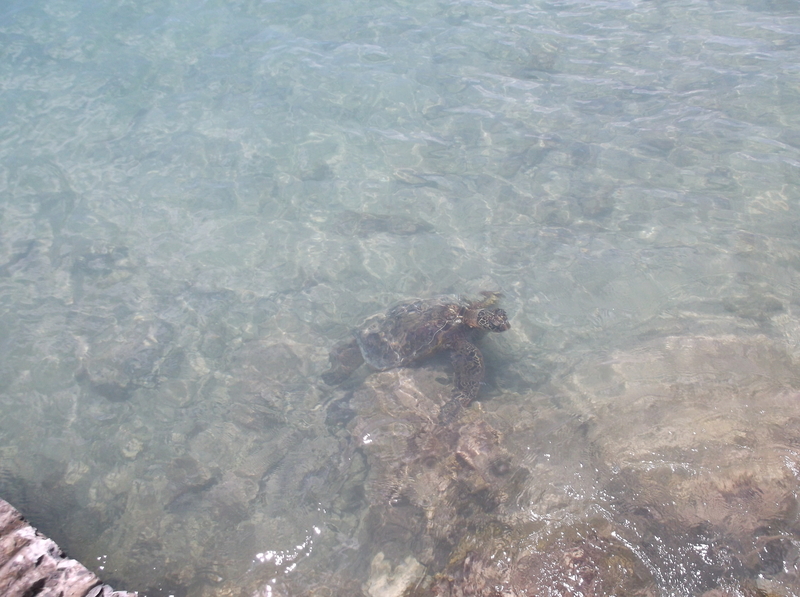 There were several Turtle beaches that we went to, but this guy showed up in Waikiki. You just never know. 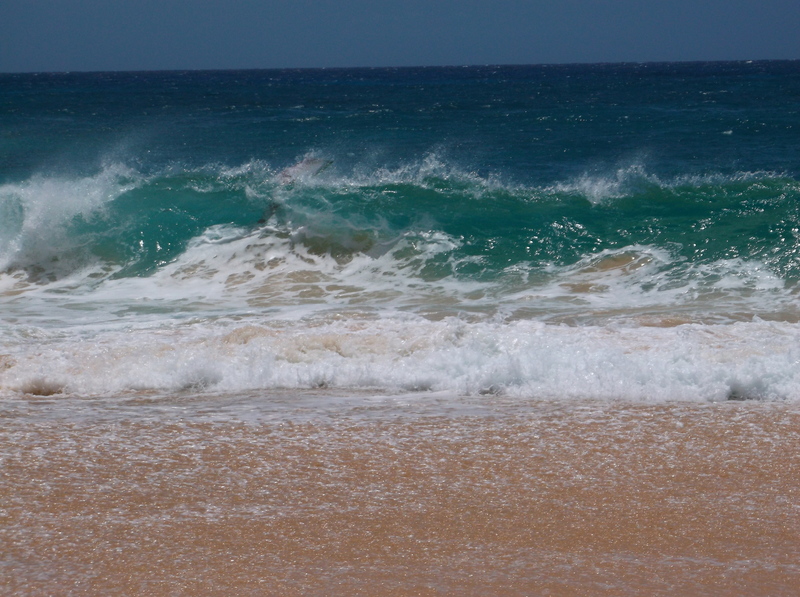 Hawaii beaches offer up a lot of variety and beauty and we loved every minute we got to spend on one.